A beautiful hardcover book with a full color interior, a ribbon to mark your page, and two CDs of music. 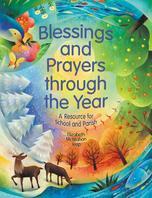 You'll find prayers, blessings, and rituals for school and parish life, as well as twenty-seven songs - enough for a full year of celebrations. The book has a clear, easy-to-follow format and offers helpful background information and preparation ideas for teachers and other prayer leaders. The first CD provides musical accompaniment and vocals to teach songs for prayer and the second provides musical accompaniment only. There are also printed music pages for teaching and for singing together. Groups can begin using this valuable resource at any time during the year.